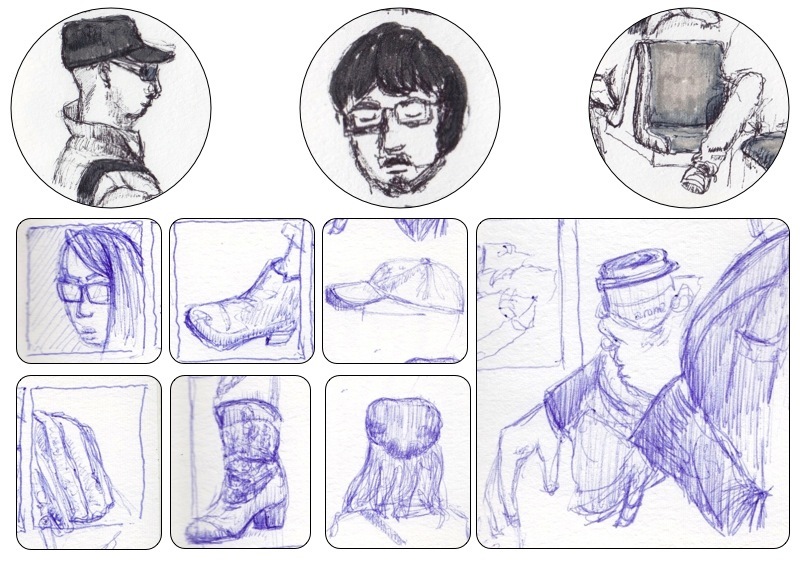 I often don't have time to sketch people while in the subway as they move around and don't necessarily stay put or stay visible long enough to do a proper sketch. It was a little frustrating at first, then I started to do little vignettes of details, not really worrying about being able to draw everything. As long as I get to draw a piece of something : a shoe, a hat, a pair of glasses, a cup of coffee, etc. Put together, they strangely tell a story about the people who regularly take the subway and perhaps their fashion sense. It's interesting how some sketches still tell a story, or at least a hint of a story, like the guy on the top left who was reading with his sunglasses on. Was he really reading? Could he really see the words on the page or was he just faking it?